This morning, thirty-three miners are being winched to freedom from their incarceration of over two months deep underground. 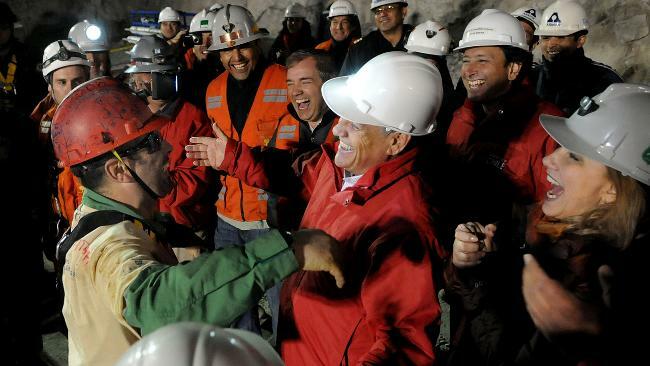 There are jubilant scenes as I write as the sixth miner is now comforted by his loved ones, emergency workers and Chilean President Sebastian Pinera at the surface. The quite amazing apparatus designed and built to free the men is slowly but surely bringing them back to the world one by one. Mr. Pinera describes the events as a miracle and they truly are. The operation began just after 11pm local time the previous evening with technical expert, a Mr. Manuel Gonzalez, truly a brave man indeed, being lowered more than 2000ft down the rescue shaft in the specially designed ‘Phoenix’ one-man lift. A live feed showed that Mr. Gonzalez handed over to the miner who was considered the fittest to be raised up to his liberty after the long, long wait deep in the bowels of the earth. A minute after arriving at the surface the first miner, Florencio Avalos stepped out of the tiny capsule to be greeted by his family. Mr. Avalos indicated with a raised thumb that he was fine before being taken away in an ambulance to a medical centre and to be given time with his family. All around the massed crowds rang out with the cry of ‘Chile, Chile’. The operation will not be over until all thirty-three miners are back on the surface but the portents are good. It’s hard not to feel the joy of those people in Chile. As a claustrophobia sufferer I find it painful to even consider what these men have gone through and the things that must have been going through their minds, particularly in the early days of being trapped before an escape plan was formulated. It was said in early reports that incidences of depression were apparent and the hopelessness that they must have been feeling in those initial stages must have been almost too hard to bare. ‘I have been with God and with the devil. I fought between the two. I seized the hand of God, it was the best hand. 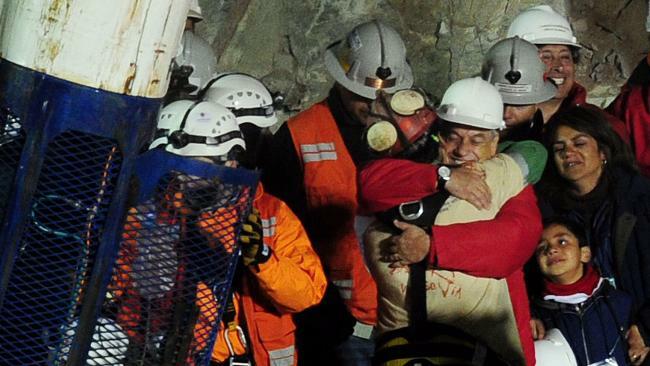 I always knew God would get us out of there.’ Mario Sepulveda, second rescued miner. I was pleased to hear that all of the men and their families will likely experience financial security in the future due to compensation and I hope this comes to pass. It has also been said that their stories and accounts will be greatly in demand from the world media. Additionally it’s difficult to imagine that a full-blown Hollywood blockbuster will not be made about this amazing story. Psychology tells us that early euphoria can easily give way to subsequent depression and anxiety when reality bites in the future. The men will have to try to deal with family relationships, a new ‘hero’ status and perhaps the most sizeable challenge of all, their thoughts and memories of being trapped. God bless them in their journey back to everyday life. The story is an absolute credit to miners the world over. As a person who had a father who spent many years underground in the mines of Fife and Nottinghamshire I know of the great kinship and comradeship that miners have with each other. Living in a county with many former coal mines and knowing many former miners I know that the story is always the same. These men trust each other down there in the depths of the earth, they have to. There is a unique bond amongst them that keeps the occupation possible. I think you can tell of my admiration for this breed of men for they do, and have done, an often vital job that I know I could not do. Some political figures have sought to destroy the spirit of the miners over the years but it seems like that indomitable spirit lives one. Wherever we come from, we should all be proud of the Chilean miners, they illustrate the great strength of the human spirit to survive, something we all need to remember sometimes. Also having a father who spent his career in the Scottish coal mines I too have been watching the story with extra interest. I remember as a boy going along to mine rescue competitions with my dad, watching the men crawling along artificial ‘tunnels’ constructed in a shed on the surface, wearing gas masks and communicating with hooters on their belts. The technology which has brought these Chilean miners back to the world of the living probably didn’t exist in a practical sense in my father’s day and thankfully it was never needed in any pit under his watch. He has told me of how his superiors at the NCB once forced him to work a highly dangerous section at Lady Vic against all his best judgement and how he lived in terror all the time he had to send men into a place that could have killed them at any moment. He has always had a rather ambivalent attitude to the mining museum there as a result of that time, I think. You would hope that episodes such as this would guarantee better conditions for the miners of Chile from here on, but then when you hear of how the situation arose in the first place you realise that none of the improvements in safety fought for over decades by British miners have been transmitted to all corners of the globe. You look at the apalling death rates in China and elsewhere and understand that capital will always drive down standards wherever they can. The price of minerals is as closely tied to the price of a man’s life as it is to commodity values, and sadly a man’s life comes very cheap in many countries. Cheers Fraser and and thanks for the excellent insightful comments. You have it just right of course and with increasing demand from the likes of a burgeoning Chinese economy one wonders how many more miners lives will be put at risk. Life i cheap eh. I was interested in the stories of your father’s time in the pits, I think every miner’s son (or daughter) can relate one or two of those. My own father was lucky to be pulled out of a local mine after a rock fall. He surfaced with various injuries and notably one ear hanging on by a strand of flesh. He was comparatively lucky but still this took its toll on his hearing for the rest of his life. I’m glad you feel the way I do about these brave men. I’m beginning to identify that many other miner’s sons and daughters feel similarly.